To: All Toyota Owners and the General Public. Our family bought a new 2004 Toyota Sienna for $34,000. here in Newport Beach, California. She was slowly accelerating from a complete stop in a small line of traffic. cars in front of her were starting to slow again. slammed into the back of a van, stopped at the crosswalk. During this entire episode they never traveled more than 20 miles per hour. There was an injury to a person in the van that she rear ended. Failure” to the Dealership where we purchased the car and Toyota Motor Corporation. After all, if the car won’t stop, it must be the brakes. following to closely or not paying attention. They did not take our concerns seriously. ignition cycles in its memory. to determine the exact cause of the failure(s). After much delay and resistance, Toyota finally sent out an inspector to look at the car. good and working condition. Of course the pads were good, the car was NEW. computer or any other issue. door locks, air bags, the whole darn thing. say that there was no problem. I called Toyota 20 times, and could never get anyone at Toyota to speak with me. I did the same with the Dealer. Orange, the dealership where we purchased the car. frame on a vehicle reduces the value by about $5000. 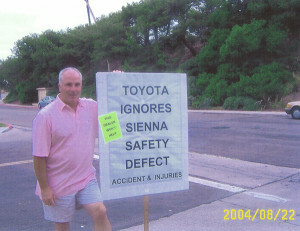 Toyota Motor Corporation and they need to discover and fix. somewhere within the car, I refused to drive the car ever again. pay for all impound and storage fees, I agreed to have the car towed to our home. the vehicle back to them. that the vehicle had a safety defect. I WARNED THEM. 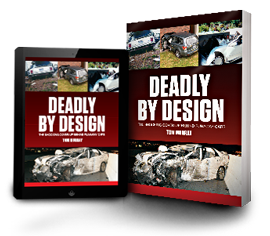 been involved in a traffic accident caused by an unresolved defect. I took a complete bath on the re-sale of the car. car for over 3 months. organizations, government agencies and the like. of the brake inspection and would not assist us any further. investigation and deferred to the brake inspection report produced by Toyota. I filed a complaint with Advocates for Highway and Auto Safety. I filed a complaint with The Center for Auto Safety. case because the vehicle was involved in an accident. every kind regarding the mechanical aspects of the car. system and computer system for the car. I became a resident expert. braking system but they failed to do so. a car must have at leas 3 trips to the dealer to address the same problem. any legal action. Besides that, I hate law suits! included as an attachment with this letter. I was harassed and ridiculed by the sales staff on the lot. I was threatened with arrest by the Management of Toyota of Orange. times for about 4 hours each time. and all of the attention that it rightfully deserves. numerous complaints that were filed by me and others? that have recently taken place. We knew that something was wrong with the car. Toyota wanted us to think that it was entirely our fault and that we were crazy.